Jumping for JOY- June Client Spotlight & Challenge Winner! The month of June we have encouraged you to light a fire within! We want to help you ignite the flame of passion for whole body health and wellness! Last week we challenged each of you to try the 5 Day Food Journal Challenge. We had so many amazing clients commit to 5-days of food journaling. Thank YOU for pushing yourself and committing to living transformed! If you didn't get to try the challenge last week, don't worry- it's never too late to start! Try it again this week! One of our clients, Joy Cooper took on this challenge and saw such transformation, as a result! Joy is an amazing mother and such a dedicated hard worker! You will see Joy and her beautiful daughter Hannah sweating together in the studio! They both always give 110% effort in and out of TransFit! Joy is dedicated to living transformed and has learned about the importance of accountability and dedication, even when it might be challenging! Joy has been food journaling and committed to our 5-day challenge! We are proud to announce her as our JUNE Client Spotlight and the Food Journal Challenge Winner! We are excited for you to read her journey and for you to see progress and total body, mind, and spirit transformation she is making one day at a time! My name is Joy Cooper, I am a single mom to 3 AMAZING kids. We have been homeschooling for 9 years. I am a tutor with Classical Conversations, a VIPKID English teacher to children in China and a small group leader at Athens Church for a 9th-grade girls group. I have been attending the TransFit luncheons, classes, and Bible study for the past few years but never very consistently. I wanted to be more consistent but I just couldn’t make it happen. I had even tried the “My Fitness Pal” app before but just could not commit to figuring out the daily meals and snacks. A few weeks ago when Caroline mentioned that they were going to have a “My Fitness Pal” app challenge, it happened to coincide with my desire for change and accountability! So… I decided that I should try to figure out the app to track our food and water intake. My daughter, Hannah, has been using the app for a year! She helped us figure out the app and plan out our meals for the first few days. I will say that once you figure out the first few days it does seem to get easier. Hannah knew that I liked little treats at the end of my day so she had me add my “treats” in first so that I had enough at the end of the day for a treat. (piece of dark chocolate or a serving of Halo ice cream) When I first started using the App, I was AMAZED at how many things that I would just pick up and eat throughout the day. The App is a great accountability partner! I now have set a goal to go to 3 TransFit classes a week. I plan ahead and make my schedule fit around the classes. I love the encouraging atmosphere and people at TransFit. At the end of every session when we are stretching and relaxing with music that encourages our hearts and God’s Word proclaimed over our lives, I am refreshed and ready for what God has planned for the day. One of my favorite verses is from Psalms 34:5 “Those who look to HIM are RADIANT; their faces are never covered with shame.” Every time I leave TransFit I am reminded to “look to Him”. God is the one that inspires me and encourages me but he uses the sweet ladies of TransFit to remind me of just how good He is and how much He loves me! I LOVE worshiping my Heavenly Father with these ladies each week in the TransFit Studio. My favorite foods right now are the Halo “Candy Bar” ice cream, Oatmega bar “chocolate coconut”, Hint “mango grapefruit” water and Trader Joe’s “Cowboy Quinoa veggie burger. 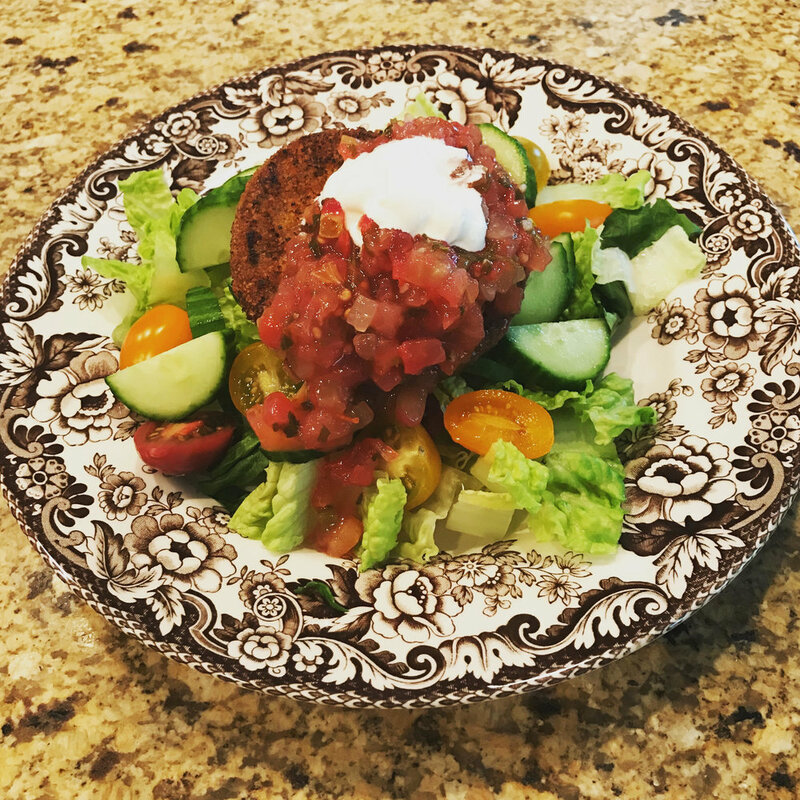 I have been making a salad with the veggie burger, romaine lettuce, grape tomatoes, mini cucumber, 1/2 cup of fresh salsa from Sam’s and a Tsp of sour cream. Joy, we are SO proud of YOU! Keep taking it one day at a time, planning ahead, staying accountable and keep motivated to reach your goals! Ladies, may we feel encouraged to make June our best yet! We look forward to seeing you in the studio this week! Don't forget about our SUMMER SIZZLER SALE! 20% off ALL MERCHANDISE with the code SIZZLE on Etsy or in store! Sale ends SOON! Remember to sign up for group sessions or 1-1 sessions on our FREE app! If you can't make it to the studio this week, you can find great recipes, workouts, and inspiration on our app and website! If you have any questions, please email us at transfitathens@gmail.com. SHOP SUMMER SIZZLER SALE HERE! Transformation Tuesday- NEW Recipes You Need to Transform Your Nutrition! How to Live Transformed on Vacation! 5 Tips You Can Take ANYWHERE!